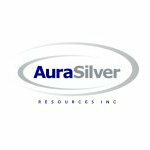 Aura Silver Resources Inc. is a Canadian exploration company engaged in the discovery of precious metal deposits with a focus on silver. The Company has concentrated its search on precious metal districts in North America. Aura Silver is publicly listed on the Toronto Venture Exchange under the ticker symbol "AUU". Aura Silver is also exploring the Greyhound Lake project, a highly propective silver and base metal property within an Archean Greenstone Belt in northern Canada where recent prospecting uncovered subcrop rock assaying up 28 g/t gold, 3,400 g/t silver, 9.2% copper and 18.5% zinc.